Upon further review, judges have amended the egg count total for Tuesday. Yesterday, I reported that Cyndie found six eggs. Last night she updated the count. Turns out, Jackie had collected 2 eggs herself that day. The total has increased to 8! With all the news frantically shouting about the hurricane bearing down on the US east coast, those of us in the middle of the continent are enjoying very summer-like conditions. 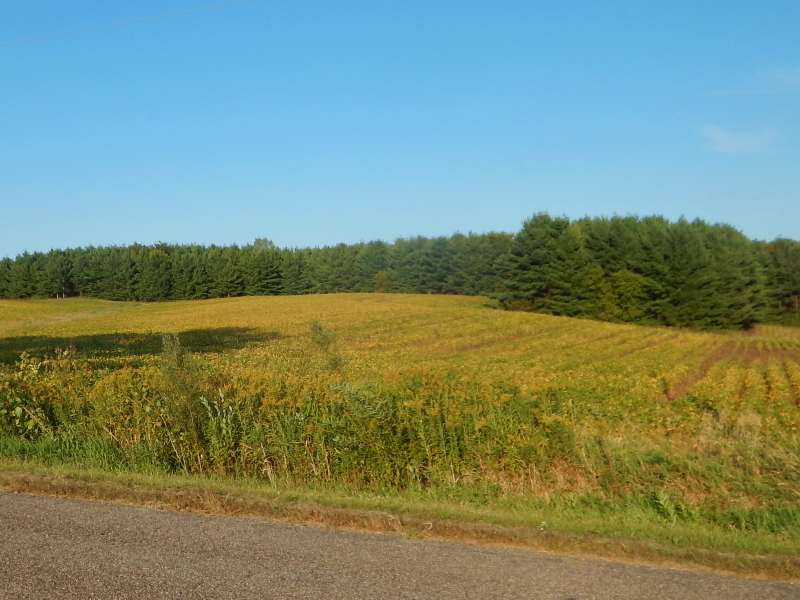 My drive home yesterday brought me through fields that are changing from the deep green of summer to hues of yellow and gold. Navigating my way around the house in the mornings before work has returned to the dark ages, and the hour of closing the chicken coop at night has moved up to around 7:30 p.m., about an hour and a half earlier than just a short while ago. Last night, a pack of coyotes whooped it up somewhere within hearing distance of our windows. It sounded very similar to the group yelping we heard the first year we moved here, after which we discovered the carcass of the 8-point buck in our woods. The change of seasons makes life feel more adventurous. It’s adventure that I greatly prefer, compared to an ominous threat of once-in-a-lifetime, climate-change-amplified hurricanes looming large. Counting my blessings while I have the luxury, and sending love to those facing the challenges of preparations for evacuations, wind damage, and flooding. It’s supposed to be like riding a bike. Once you know how, simply climbing aboard and spinning the pedals is all it takes to get going again, right? Not always. First off, there is a wide disparity between physical reality and imagined accomplishment. I envision myself gliding along almost effortlessly along the road for hours on end. Having not been on my bike for almost a year, my experience now is far short of where my abilities have been in the past. I’m not built with the sleek body type of competitive cyclists. I ride a heavy old bike that is decades old. The unconscious reactions of shifting aren’t there, causing inadvertent pushing on a lever that should have been pulled. Being uncomfortable on the saddle influences the deviation from my ideal pedal cadence. I’m forgetting to hydrate enough while riding. My brain is visualizing ideal performance, my body is struggling to cope against gravity. After five consecutive days of riding, I have progressed to a level where glimpses of my old self are showing up, which is encouraging. I’m already sitting more comfortably and this helps to bring my cadence up to improve performance. It’s just like riding a bike. In my desire to dodge the exhausting climb of the many hills around here in my quest for time on the bike, I selected a flat route a couple of days ago that offered a life lesson. It was easier, but it was a lot more boring. Empty farm fields and dreary ditches. Instead of wild flowers, there were empty beer cans, likely jettisoned by kids seeking to get rid of evidence. 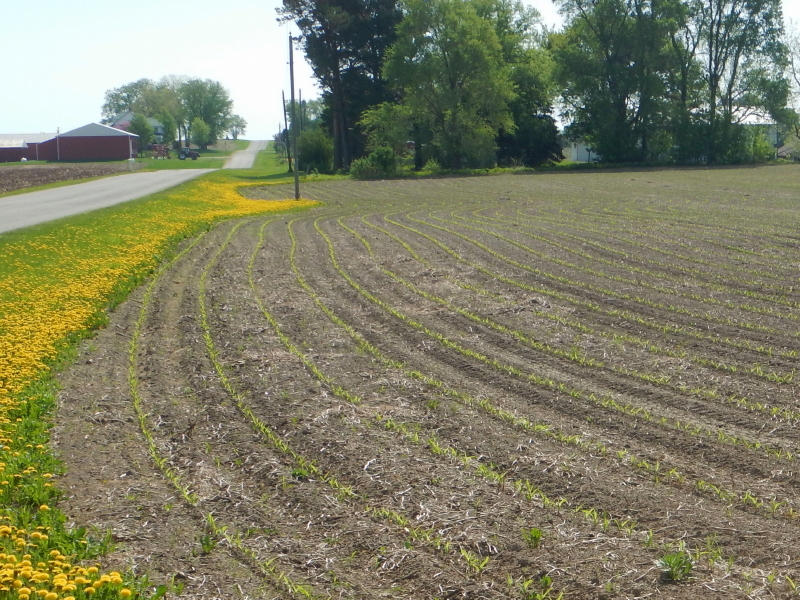 On one side of the road there were rows of sprouting shoots of corn plants. On the other side, a whole lot of nothing. Seeking a return of adventure, the next day I girded myself for some climbing and got back into the more interesting terrain that offered views of trillium and livestock. As I ever so slowly climbed one hill, I looked up to find three horses, side by side, staring directly at me. It felt like they were enjoying the spectacle of my slog up. It was a fabulous picture, but before I could pull the camera out of my jersey pocket, two of the horses lost interest and went back to grazing. This brought me to the field where I had seen bison a few days earlier. Ian had challenged me to present a photo. Nobody home! Where’d they go? I’m not sure. 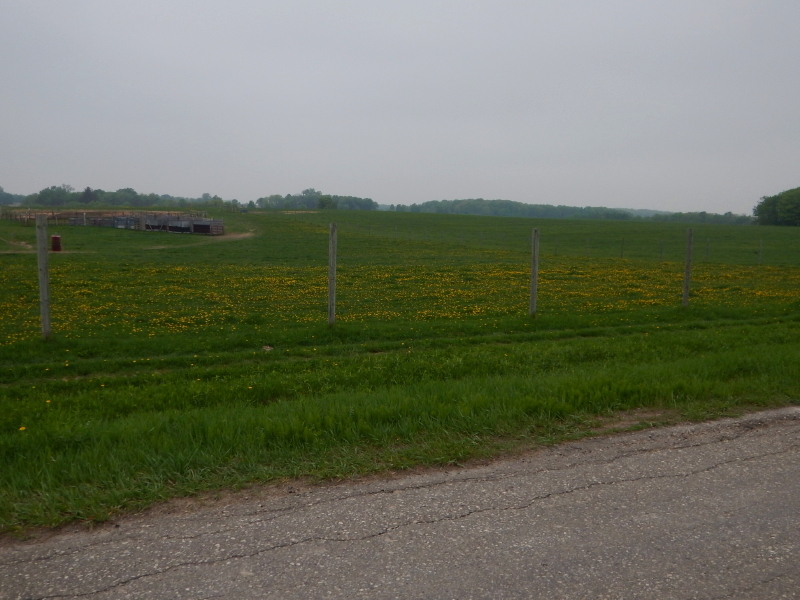 Maybe there is more grazing pasture beyond the horizon that I can’t see from the road. It’s off the beaten path enough, with the road turning to gravel, that it’s not a farm I regularly pass, so I am unfamiliar with their routine. Bolstered with a renewed sense of adventure, I overcame my aversion for rolling my skinny tires over the hazardous surface and forged ahead on the rough road. In a lesson that translates easily to life, I was richly rewarded with an amazing exposure to a rich variety of landscape, life, and activity that exists, mostly unknown to us, in surprising proximity to our home. The road less traveled, you know? This round goes to Mother Nature. I’ve heard tell that our warmer climate allows the atmosphere to hold more moisture. 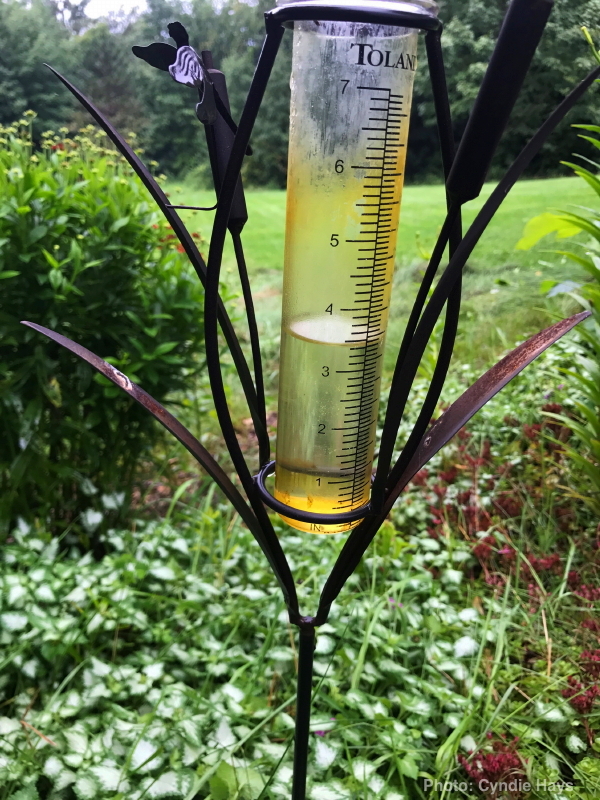 With a pattern of increasing frequency, our anecdotal evidence of the years we have lived here is that downpours are increasingly bringing multi-inch totals that overwhelm the old drainage paths. Overnight Wednesday we received over 2 inches, bringing the 24-hour total to more than 5.5 inches. When I combine our experience and the recorded data of measurable climbing global temperatures, I get the impression we are seeing the beginning of downpour trend that will, at best, keep happening at this level, or worse, continue to grow more extreme. 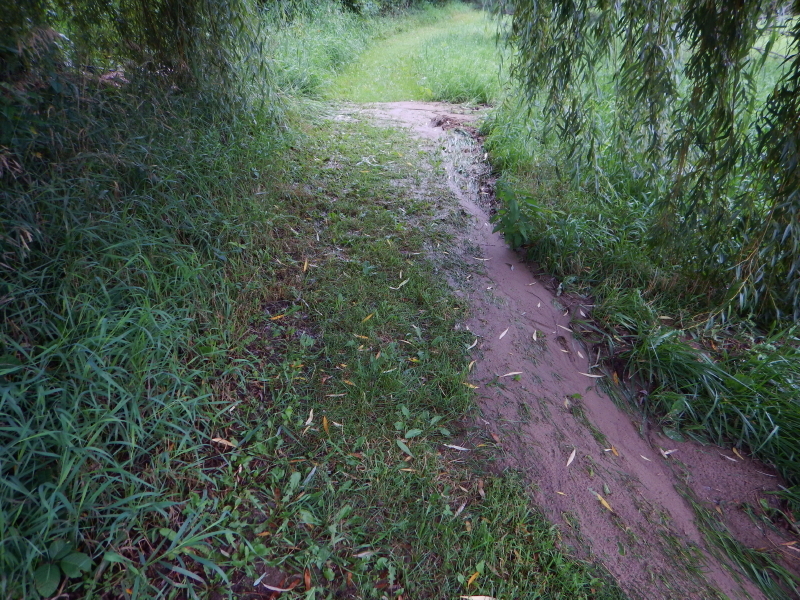 This presents a daunting challenge for devising a plan to improve our drainage paths to a point they will be able to handle ever-increasing volumes of massive flow in a manner that avoids major washouts, if that is even possible. Our attempt to stem the tide of topsoil flowing from the neighbor’s cornfield came up short of successful after not very many storms. I don’t know if there is a more industrial version of a silt fence or we just need to pull out and re-install the one we have, above the new ground level. 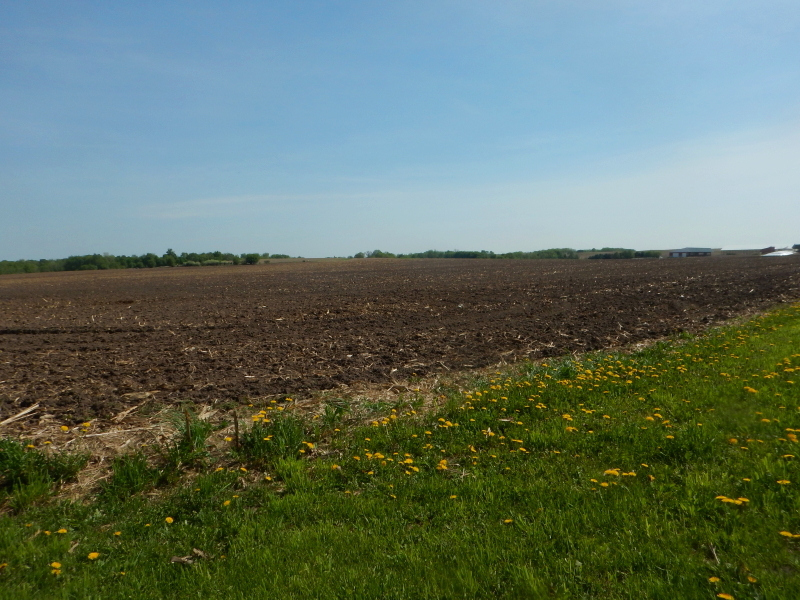 Ideally, we would like to enlist the assistance of the neighbor-farmer to get him to not plow the portions of that field where the runoff flows and instead, create a grassed-waterway. Recent efforts to contact him have thus far failed. I have a sense that his not having already maintained a protective waterway reveals a certain lack of interest in having one, so I’m imagining I may need to be prepared to offer a convincing sales pitch. 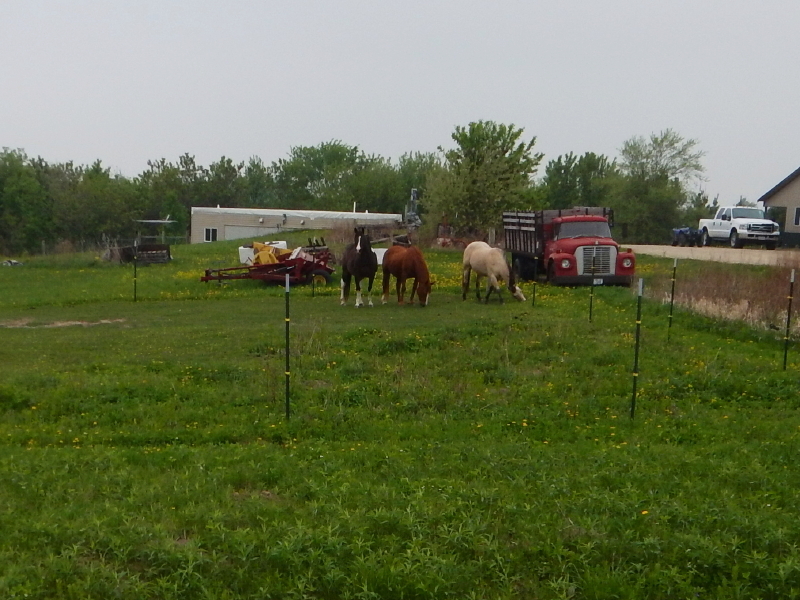 I suppose I could pull out the corn plants that washed down from his field and are now growing on our property, and bring them over to his house to see if he wants them back. If it wasn’t so much work, I’d love to also bring him a load of the mud that poured out of his field and now covers the grass of our walking trail. Since the rain will likely keep dumping on us, maybe his field will just empty out and that problem will go away. I can switch my attention to marketing the sale of a large amount of sifted soil that magically became ours when it crossed the property line. Anyone need some August rain? We have extra. I’d be happy to share. Unfortunately, all that water fell in a very short amount of time yesterday morning, so the result was something of a flash-flood type of runoff. Our silt fence along the northern border below our neighbor’s corn field was already filled with sandy topsoil that has flowed with every rainfall since we installed it. 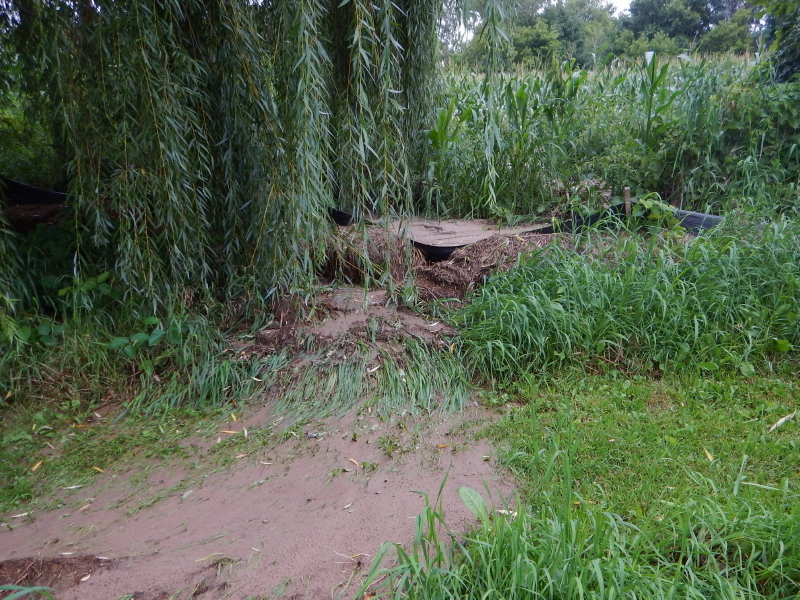 That led to an overflow which flattened some of our grass beneath an inch or two of silty muck. Balancing that negative with a positive, the trail at the bottom of our hill in the woods, where I placed the pavers, is working perfectly. 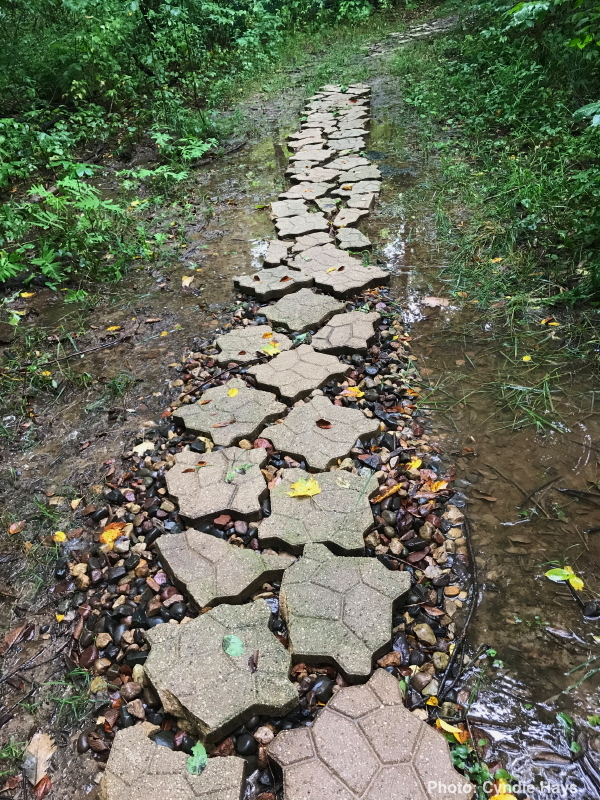 There is a small lake-like puddle where I spread the salvaged landscape rock, while the pavers are providing excellent (dry) footing across that rest of that section. The amount that fell overnight will get tallied after the sun comes up today, but by the looks of the radar and sound on the roof and skylight last night, we got a lot more of the unneeded wet stuff than we wanted. I sure wish I could transfer a large amount of it to the drought-stricken regions that need the water a lot more than we do.